The God of Wealth is Back on Summer Weekends! Summer weekends have never felt this hot! Chill out from the high temperatures with Mr. Sloto’s 77% Match + 77 Wealthy Spins! 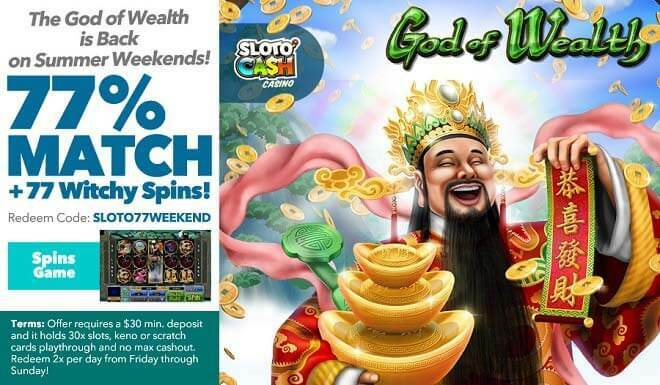 Spin the reels of God of Wealth and the Scatter gold ingot will help you amass summer weekend wins with free spins whereas the wild God of Wealth icon will only appear on reel three in normal games and replace the Dragon, Tiger and Ox symbols to create wins doubling your original bet! An ideal summer begins with the perfect weekends chilling and winning in the company of Mr. Sloto’s 77% Match + 77 God of Wealth Spins! Play a 77% Match + 77 Wealthy Spins!